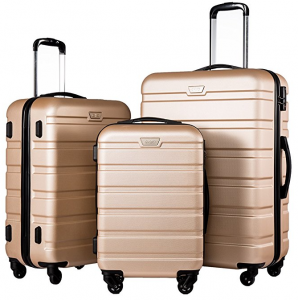 The Coolife Luggage 3 piece spinner set is designed by a young, up-and-coming company who place great emphasis on a modern, sleek, stylish approach. 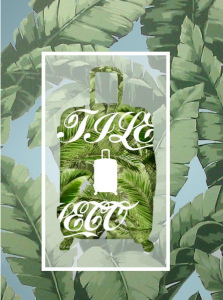 The unique design of the luggage will enable you to quickly identify it at the luggage carousel, so no longer will you be waiting for hours wondering if someone else has picked up your case. 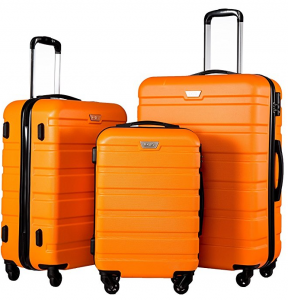 The suitcases are made from ABS and have a polycarbonate film, which ensures that they are strong, durable and scratch resistant. 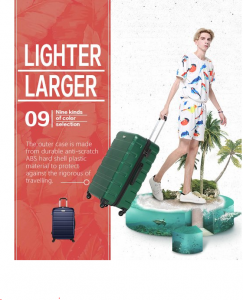 As they are hard-sided suitcases, they will be slightly heavier than the soft-sided alternatives, although the gap between hard and soft-sided suitcases has been shrinking in recent years. 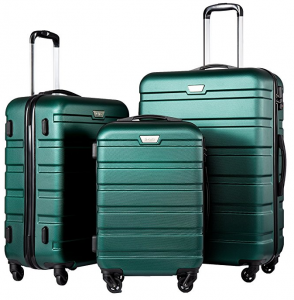 Each suitcase is equipped with a telescopic handle and four silent spinner wheels for ease of use. The carry-on has a capacity of 38 liters, the medium 60 liters, and the large 93 liters. As the handle retracts into the suitcase, it takes up some of the storage space inside the main compartment. 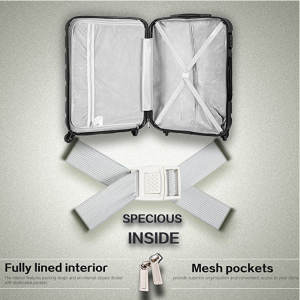 As with most hard-sided suitcases, they open up in a 50/50 split, with one compartment mesh lined, with pockets, allowing you to secure items and organize into sections. The other compartment has an x strap which will hold your clothes down and keep them in place when the suitcase is in use. 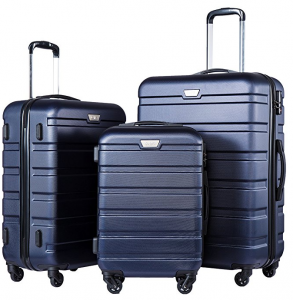 As the Coolife Luggage 3 piece spinner set is designed by a youthful company, you can be sure that it comes with some modern features. The 3 step telescopic handle will make you feel confident that it will stand up to the rigors of airport transit. An ergonomic handle keeps in mind that your hand needs to be taken care of. 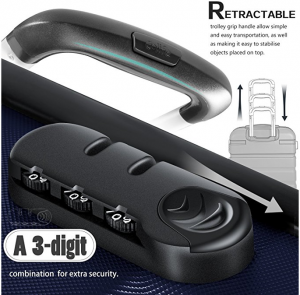 Coming with an integrated TSA approved lock, you will be assured that your valuables are safe and secure, without having to look for that misplaced lock moments before you are meant to travel to the airport, with the cab waiting outside. The 4-spinner wheels are lightweight, durable and designed to be used in the hustle and bustle of the airport. The carry-on weighs in at 6.3 lbs, the medium at 8.1 lbs, and the large at 10.2 lbs. Yes, they are slightly heavier than the soft-sided alternatives currently on the market, however, it is that trade-off between weight and durability that you have to make. Slightly heavier could be the difference between, you coming in just under or just over the airline allowance. 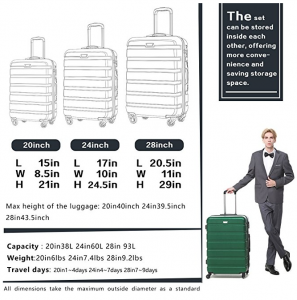 Although, technology in recent years has reduced the gap in weight difference between soft-sided and hard-sided suitcases, making hard-sided suitcases more desirable for lightweight travelers. Made from ABS and PC, the hard-sided suitcase is more durable than the fabric alternatives that are currently available. 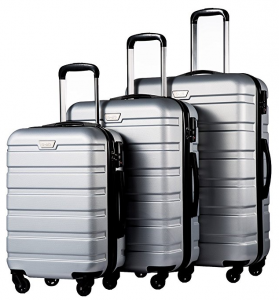 The polycarbonate film ensures that any scratches or bumps should not mark your suitcases, meaning it will stay stylish even after being roughly handled by the luggage handlers at the airport. As Coolife is a relatively young company, it is hard to see how their past luggage has stood up to the test of time. 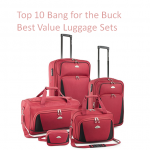 But, based on the information we have and what we can see, it is safe to say that for the price you pay is what you get when it comes to luggage. Available in a multitude of colors, you will be able to find the perfect color to suit your individual style. With the vivid color and unique design will make sure you will be able to easily find it when searching for your luggage. 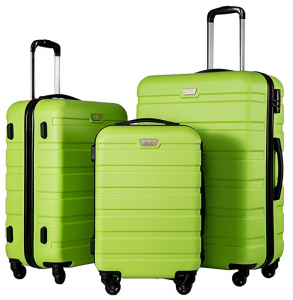 With most hard-sided suitcases, it can be bumped and scuffed when being used, the polycarbonate film is designed to not show these, however, note that the bag may still scratch and mark the stylish suitcase you purchased. The carry-on measures at 21.5 x 15 x 9 inches, which is at the limit of what some major airlines will allow, check with your airline before going to the airport, as you may be disappointed and having to check it. The medium suitcase measure in at 26.5 x16.5 x 10.5 inches, giving you ample space, while still being easy to maneuver. The large suitcase measures 30 x 20.5 x 11 inches, giving you extra space to take the items you desire, with extra room to bring souvenirs back. As with all hard-sided suitcases, it will not expand if overpacked, keeping you confident that the suitcase will fit in that overhead locker, car trunk, or closet. 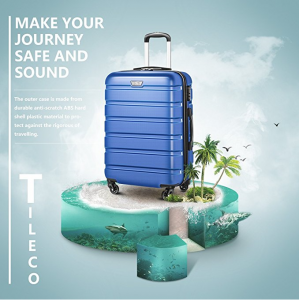 The Coolife Luggage comes with a 2-year warranty, which they claim to be worldwide. It is not as long as other, more reputable brands, so I would say to consider this, when making a decision. Although at this price, would it be worth testing the warranty out? 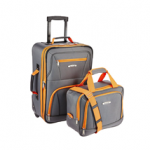 The Coolife Luggage comes in at a relatively low price for the features that it is packing.  If you are short on cash or not looking at investing in luggage for the long-term then this may be a viable option for you. If you do go ahead and purchase this set, make sure you can open the lock before you decide to do your last minute packing as it is known to arrive with the lock closed and a struggle to unlock. If you contact the Coolife Amazon seller and submit your warranty claim to them, they should be taking care of your warranty case.